Hi there! Happy Wednesday! Let's take a look at what'cha been workin' on! After attending a van Gogh 101 workshop at Mango Reclaimed, Ashley restyled this gorgeous hutch! I LOVE the beautiful pop of colour! Seriously, I love the blue! 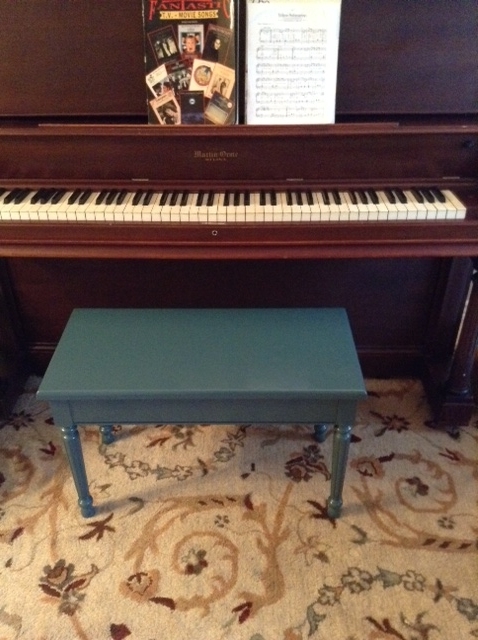 Janice has been using our new Fusion paint and did a great job restyling her piano bench. She did such a great job in fact that when her husband first saw it, he thought she had gone out and bought a new one! Fantastic! Wow! Linda has jumped right in and restyled her upholstered chairs using van Gogh's Patina - that's right she painted her upholstered chairs - fabric and everything! I think they turned out beautiful, it's no wonder why she has enjoyed showing them off to family and friends! Linda is considering painting out her kitchen cabinets next - I think she should go for it! This restyled Sears french provincial dresser by Tara looks stunning and works great as a sideboard in her dining room! Woah - and the before. Nice work Tara!